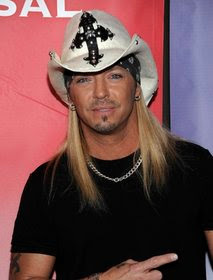 LOS ANGELES – Bret Michaels is in critical condition suffering from a brain hemorrhage, his publicist said Friday. Mignano said tests are being conducted but did not know where he was being treated. The 47-year-old glam-rock reality TV star had an emergency appendectomy at a private care facility for diabetics last week after complaining of stomach pains before he was scheduled to perform at Sea World in San Antonio, Texas. Michaels later wrote on his website that though the surgery "has taken its toll," doctors expected him to make a full recovery. Michaels is currently a contestant on the third season of Donald Trump's NBC competitive reality show, "The Celebrity Apprentice." For the first six episodes, Michaels served as a lighting rod for the show's male team, avoiding being fired in the boardroom. "He's a great competitor and champion, and I hope he will be fine," Trump said. Before joining "The Celebrity Apprentice," Michaels starred as the lothario on VH1's lusty reality dating series "Rock of Love" from 2007 to 2009. For three seasons, Michaels searched for the women of his dreams amid a sea of implants, tattoos and thongs. He also served as a judge on the fifth season of the USA singing competition "Nashville Star" in 2007.